Quantitative genetics - Are relatives always alike? The similarity between relatives due to their shared genes is evolutionarily more important. It is possible to deduce the correlation due to shared genes among any two classes of relatives from the variance terms we have already defined. We shall consider only one case, the correlation between parents and offspring, to see how it is done. We can keep things simple by assuming that there are no environmental effects. The genetic value of the character in the parent is, we have seen, made up of several components of which only the additive component is inherited by the offspring. When mating is random, half that additive component of the individual parent is diluted (when an individual reproduces, only half its genes are inherited by its offspring). In words, the covariance of an offspring and one of its parents is equal to half the additive genetic variance of the character in the population. The formulae are useful for estimating the additive variances of real characters. However, the estimates become most interesting, for the evolutionary biologist, when expressed in terms of the statistic called heritability. 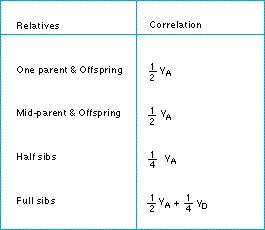 Table: the covariance between several different classes of relatives.